UNICEF released its Uprooted Report as a part of their #AChildIsAChild Campaign, encouraging the globe to take a stand to protect all children, including #ChildrenUprooted. Right now, 50 million children have been uprooted from their homes and are on the move. Children have been forcibly removed from their communities, their homes, and their families and are on the move for no other reason but survival. 28 million have been displaced due to violence and conflict. This uprooted reality is not only due to violence and conflict, but also due to a lack of economic and educational opportunity, and climate change – all the systematic ‘pushing out’ of children and their families from their homes. A new report released today by UNICEF serves as a global snapshot of the risks refugee and migrant children are facing on their journeys. It shows that an increasing number of these children are taking highly dangerous routes, often engaging smugglers, which leaves them highly vulnerable to trafficking and other forms of exploitation. 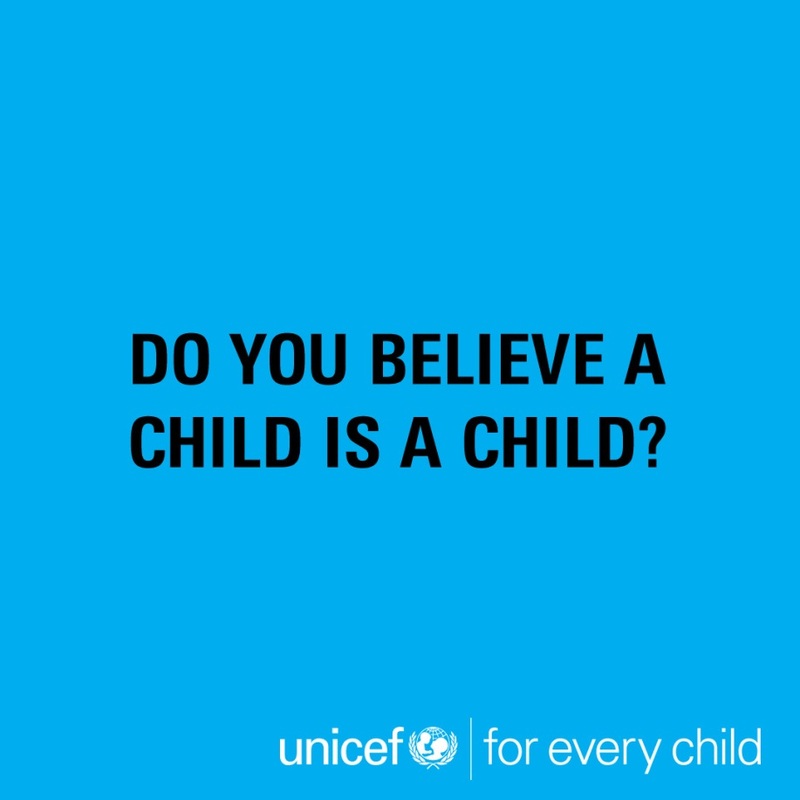 We are looking to you for your help in putting children first and protecting their rights. Often the first to be impacted by displacement are children. Children's vulnerability puts them as high risk to further dangers along the way. Exploitation, child abuse, trafficking, kidnapping, malnourishment, and even murder are just a few of the dangers that children are exposed to as they are displaced and pushed out of their homes. We know that some routes are particularly rife with risks. Through a recent International Organization for Migration survey, it was discovered that over three-quarters of 1,600 children aged 14-17 who arrived in Italy via the Central Mediterranean route reported experiences such as being coerced or forced to work without pay – the very essence of being trafficked (Uprooted Report, 6). There are strong correlations between an increase in the number of international child migrants, flows of migration, and children being exploited. In fact, according to the United Nations High Commissioner for Refugees (UNHCR), the overall number of refugees increased from 10.4 million at the end of 2011 to 16.5 million in mid-2016, with half of the world’s refugees being children. This is a reality that we can no longer deny – the time to act is now. There are a number of other factors that contribute to children being uprooted, but also children’s vulnerability to trafficking and exploitation. Factors such as nationality and legal status, belonging to an ethnic or religious minority, or having a disability all contribute to vulnerabilities for exploitation. Gender is also another major factor. A number of reports suggest that refugee women and girls, particularly those from sub-Saharan Africa, often experience violence at the hands of smugglers – harmful social norms indeed impact how children are exploited (Uprooted Report, 15). 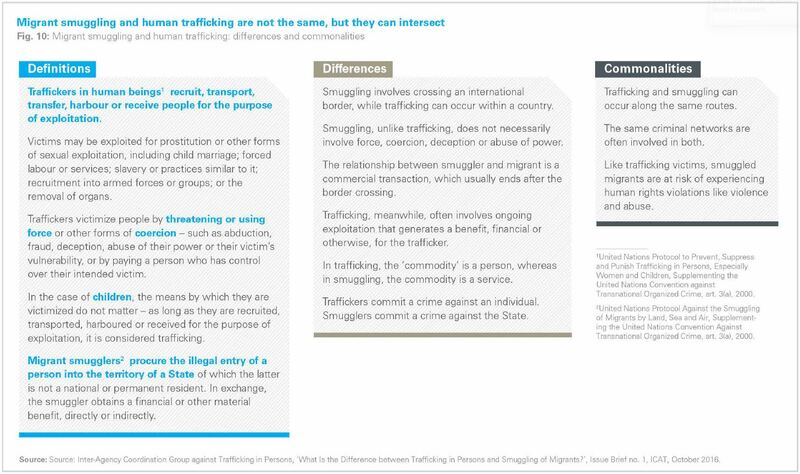 But barriers to entry, particularly for children uprooted, push children to resort to irregular channels and dangerous routes, again increasing their vulnerability to human trafficking and exploitation. Across the global in 2014 more than 21,000 migrants died along major mixed migration routes – this includes children (Uprooted Report, 25). This entire ecosystem gives birth to an underground economy for trafficking and smuggling. Thus, barriers to entry foster children’s’ distrust in state authorities. Many children are not aware of their rights and are hesitant to seek help from state agencies, civil society and international organizations. They avoid authorities and remain under the radar, thus living in hazardous conditions and traveling amidst severe environmental dangers without adequate food and health care (Uprooted Report, 28). This fear and stigmatization demonstrated though policies and laws such as “erecting physical obstacles like walls, towing boats back to sea, terminating rescues operations or empowering border guards to beat migrants back by force” do not put children first and only perpetuate fear among children, ultimately resulting in putting children at risk to trafficking and exploitation. In the United States, unaccompanied children without legal representation stand a much greater chance of being order to leave than those who have an attorney – being forced to leave puts children uprooted at high risk for trafficking and exploitation (Uprooted Report, 32). Why are they at higher risk? Because when children are deported, they are often thrust back into the very conditions they undertook dangerous journeys to escape – thus creating a never ending pipeline for trafficking and exploitation. A prime example of this is the 9,900 Afghans that returned from Pakistan in the first months of 2017 to precarious conditions with alarming numbers of food insecurity, few employment opportunities, and no access to education to 4,000 school-aged children (Uprooted Report, 32). Investing in programs that encourage education, job training and social mobility in origin countries are steps in the right direction – to mitigate systemic inequalities. Just this week we have seen what this uprooted experience has done to children around the world. 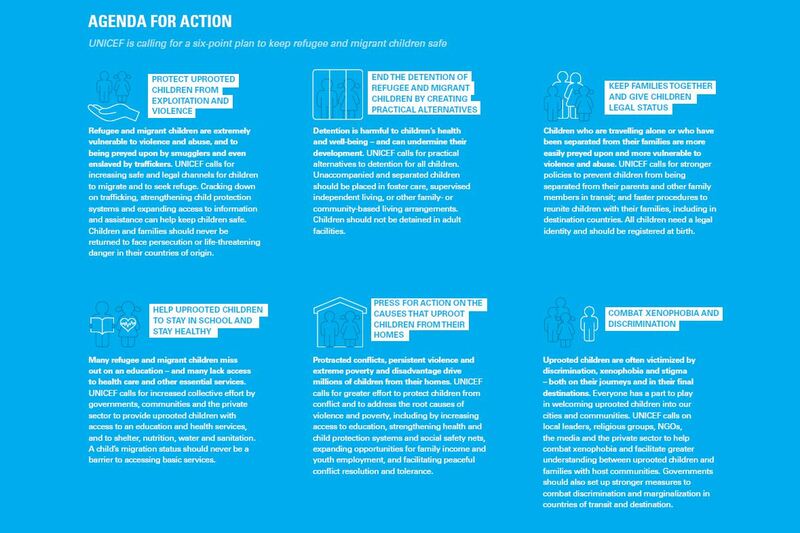 In the report, UNICEF has laid out practical steps on how to protect children through a 6-Point Agenda for Action. We know that children on the move are at high risk of being lied to, deceived, and coerced into false promises for the purpose of exploitation – this is human trafficking. In the first half of 2016, 75% of surveyed child migrants reported experiences of trafficking and exploitation. Now, in 2017, 91% of surveyed children reported experiences of trafficking and exploitation. But what else do we know? Stand with #ChildrenUprooted by signing the pledge today - share it with friends and family. Educate your community – Learn how else you can take action to protect children through our End Trafficking Toolkit. Learn the signs and report it – If you see something say something, report it to the National Human Trafficking Hotline. Also available in Spanish. Look through our other wonderful resources that are offered on our End Trafficking webpage.